Meet Google's Robot Army. It's Growing. Google can't stop buying robotics companies. In the past two months, eight of the 12 companies the search giant has acquired have "robotics" in their name or descriptions. Here's your complete breakdown of the robot army presently at Google's command. As stated in the midst of its buying spree, the company's largely letting its new robotics divisions continue to work on their preexisting projects, and why wouldn't they? The newly acquired companies are doing a damn good job. They're even winning competitions. Robot technology would help with self-driving cars, certainly, but the range of these acquisitions hints at even broader ambitions. Again, we don't know much. They're all a part of the Google X division, which is top secret by definition. We do know what the new companies in the Google family are up to, though, and that might offer us some clues. These guys are rockstars. The Japanese team that got its start at Tokyo University just took the top prize at DARPA's Robotics Challenge Trial thanks to the cunning and agility of its 5-foot, 5-inch, 209-pound bipedal robot. After being purchased by Google in early December 2013, Schaft's blue machine proved to be the best at walking on uneven terrain, climbing ladders, clearing debris, and connecting hoses, ultimately scoring an impressive 27 out of 32 possible points. The company was originally founded to build disaster response robots after the Fukushima nuclear disaster in 2011 but has since broadened its scope, thanks in part to funding from the U.S. government. Who knows how far they'll go floating on Google's coffers? Industrial Perceptions, Inc., is an imaging company that spun off of the Menlo Park robotics company Willow Garage. Before being acquired by Google in December—the day after the Schaft acquisition, in fact—IPI was focusing on building advanced technology for 3D vision-guided robots to be used in manufacturing and logistics. This includes the ability to see and sort different objects, say, in a factory. You could imagine a company like Amazon being very interested in this kind of technology, but it's so far unclear exactly what Google wants to do with it. Redwood Robotics started as a joint venture between Meka Robotics, SRI International, and Willow Garage, IPI's parent. And like IPI, it's always had a very focused mission. Redwood wants to build the "next generation arm" for robots. Meka Robotics founder Aaron Edsinger once said that he wants to do for robotic arms what the Apple II did for computers. Specifically, Redwood wants to build robotic arms that can work alongside people even in the comfort of their own home. That also means being the common arm manufacturer of service robots, so in the future, everybody's personal robot could have Redwood arms. Well, make that Google arms. Like its cousin, Redwood Robotics, Meka is dedicated to building robots that can live and work with human beings. The company describes its flagship model, the M1 Mobile Manipulator, as having "human-safe, human-soft, and human scale robot technologies that will enable the robots of tomorrow to work alongside people in the home and the workplace." The human-like faces on the robot can even emote, a feature that's as creepy as you let it be. Even before joining Google, Holomini was a pretty secretive outfit. All we really know from its now shuttered website is the company describes itself as "Creators of high-tech wheels for omnidirectional motion." The image above is just a stock photo guesstimate of what a "high-tech wheel for omnidirectional motion" might look like. If Redwood and IPI are the engineers in the family, Bot & Dolly are the artists. The company describes itself as "a design and engineering studio that specializes in automation, robotics, and filmmaking" with a mission "to advance motion control and automation as a creative medium." In reality, this means that Bot and & Dolly use robots to help film commercials and movies like Gravity. This doesn't mean that Google wants to get into the movie business, but hey, if a robot's good enough to make a movie, what else can it do? Boston Dynamics is the real celebrity of the bunch. After acquiring six robotics companies in six days, Google took a couple of days off before announcing this major acquisition. 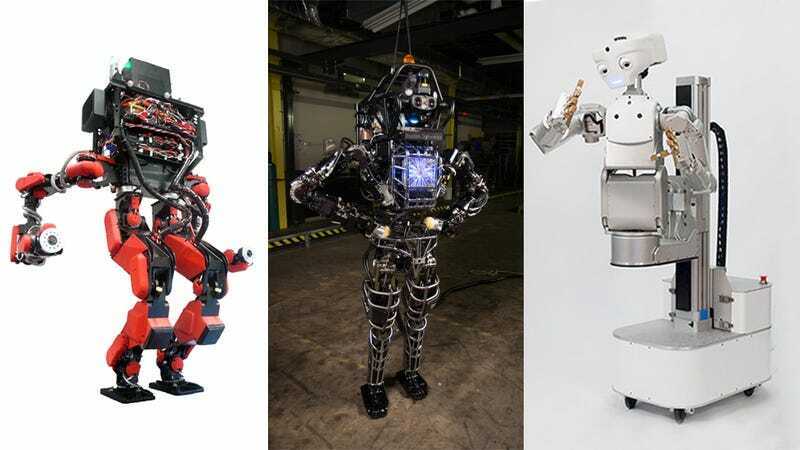 The company is known for building all kinds of futuristic bots from the bipedal, humanoid robot Atlas (above) to the impossibly fast, four-legged Cheetah. 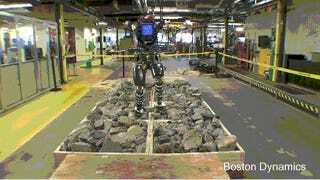 Actually, Boston Dynamics brings a whole robot army to Google, one that the military is very eager to recruit. Google's latest purchase is less interested in building an actual robot than in designing an intelligent robot brain. The self-described "cutting edge artificial intelligence company" that uses "the best techniques from machine learning and systems neuroscience to build powerful general-purpose learning algorithms: comes with a team of 75 researchers and software engineers whose talents could be put to use on anything from the hypothetical Googlebot to the company's flagship search engine and anything in between. Because after all, robots are just another step in Google becoming the company that is everywhere, and does everything.